By now, if you are on or near the East Coast you should know what Strange Days is. If you don’t, it’s an annual vintage motorcycle gathering focusing on good vibes and as the tagline says, “Expanding your motorcycle mind”. Weird bikes and weird people always crawl out of the woodwork for this event, and you’ll often see something or someone that’ll trip you out for a minute. 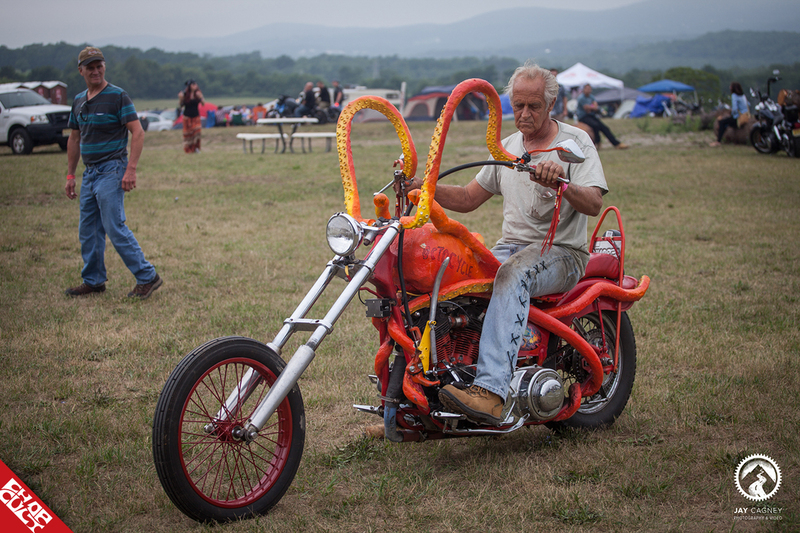 This year, for me, that something was the “Octocycle”, a crazy looking knucklehead that was made to look like some kind of underwater scene complete with tentacle handlebars. The owner sold the bike that day for dirt cheap. When was the last time you saw a complete knucklehead go for a bargain? 1. It’s held in a beautiful field below the ridge that the Appalachian Trail run through. 2. Burnouts and general “hot dogging” are not allowed, but will inevitably happen. 3. It will rain at some point in the night. 4. The beer is free until it runs out, and it will run out. 5. 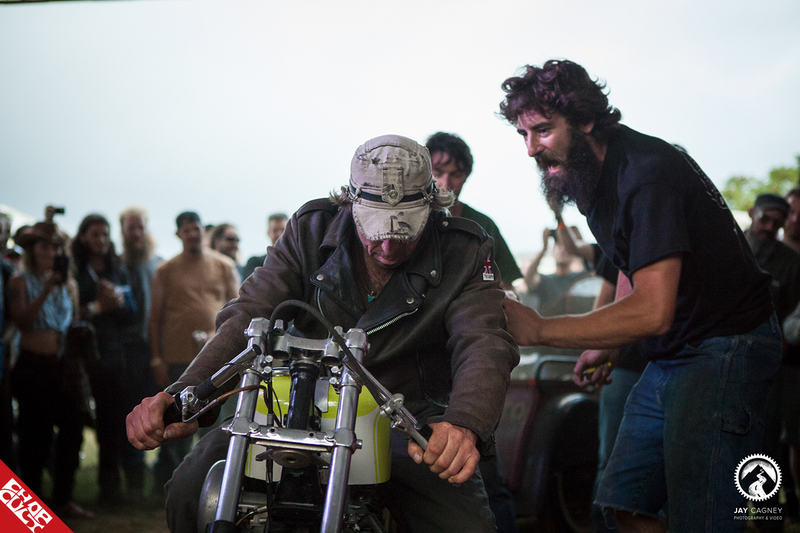 Someone will go home with an awesome custom motorcycle from the raffle. 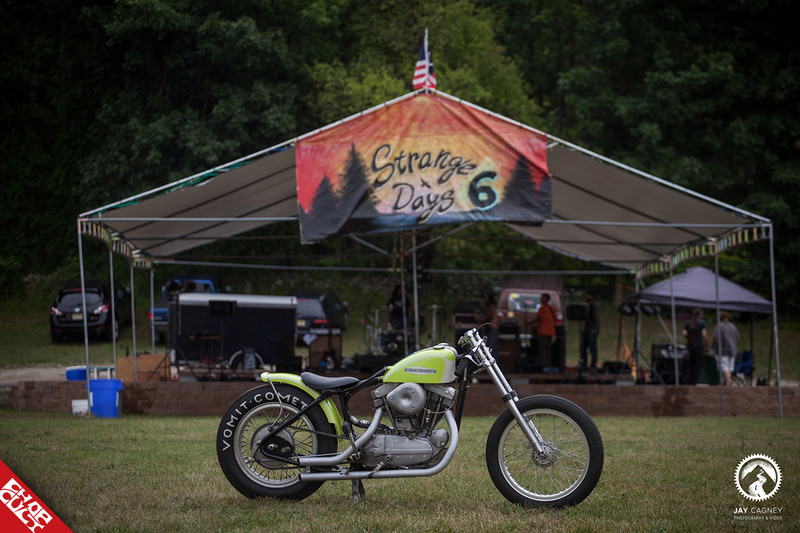 Every year Strange Days raffles off a unique custom built bike just for the event. Previous years have included a ’74 Honda CB750, a ’72 Yamaha XS650, a ’71 Sportster, and a ’74 Shovelhead. This year’s bike was a ’61 sportster set up as a drag bike, affectionately named the “Vomit Comet”. This bike was all business and meant to be tested at the drag strip; it’s awesome to see something completely different come out every year at the show. One of the special moments this year was a wedding that took place, in the middle of the party. There’s a funky archway near the fire, also known as “the portal”, where Mike and Sara got married in front of friends, family, and strangers alike. While it was supposed to be a casual ordeal, I think everyone was feeling the emotions, and it was a great way to kick off the rest of the evening. A ton of people come together to make this show happen, and a bunch of really great sponsors donated their products for the free raffle. Thanks to Ken Buongiorno, Chris Dripchak, Matt Rush, and many many others for making the event happen. It’s hard to believe that it’s been going on for six years already! See you guys next time. Strange Days - Website / Instagram. @retroworks you can, if you click the photo and it shows up in the slideshow viewer, right click on it and open in new tab it'll be full size. Awesome photos, Jay! I might just be saying that because I'm in three of them, though. haha.